Fall prevention strategies that have been studied in the research. What Works in Fall Prevention? Through normal aging, muscles lose strength and quickness, and unconscious balance reactions slow down. The normal loss of muscle is significant enough to cause fear of falling and reduced quality of life, regardless of mobility level. However, there is one effective stand-alone strategy for fall prevention. That strategy is exercise! If people keep moving their body they can help to lessen the deterioration and to remain more able to participate in daily activities. Physical therapy is an evidence-based intervention that is proven to reduce fall risk and is an effective strategy for fall prevention. Individually-prescribed home exercise programs given by physical therapists have been proven effective to reduce fall risk. Physical therapists help figure out what exercises are safe for you if you have one or more medical diagnoses, a surgical history or a recent hospital stay. In fact, EXERCISE is the only “stand alone intervention” that reduces fall risk. Researchers currently recommend 50 or more hours of balance exercises for a “fall protective effect,” so group exercise classes may be included in a comprehensive exercise plan. If you are not sure how to exercise or what exercise is safe for you considering your medical or surgical history, then it is recommended to consult with a physical therapist to get you started. Even seated exercise once a week has been shown effective to reduce fall risk. Fun and dynamic interventions now exist that have been shown to reduce fall risk, such as dancing to live piano music. How can Doctors help with Fall Prevention? If you or someone you love has fallen, is afraid of falling or is having difficulty with walking and balancing, it is recommended that you talk to your doctor and seek a fall prevention consultation with a skilled physical therapist. 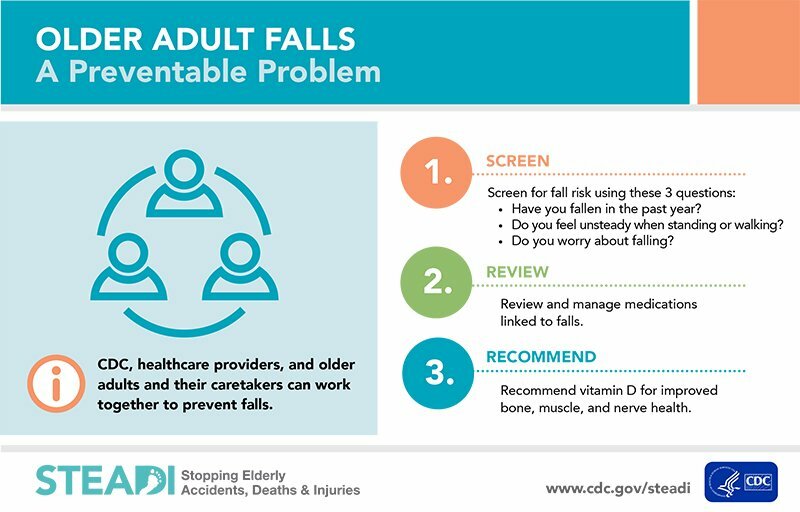 Research has shown the risk of falling is reduced exponentially when a clinician creates a multi-factorial treatment plan that addresses multiple modifiable fall risk factors. Therefore, if multiple fall risk factors are addressed by a skilled clinician, like a doctor or physical therapist, there is an exponential effect for fall prevention. The two non-modifiable fall risk factors, according to Mary Tinetti, M.D. are the patient’s age and a history of falls. There is nothing anyone can do about that! However, there are a number of modifiable risk factors that do fall within the scope of physical therapy evaluation and intervention – and certainly within the range of appropriate referrals to additional geriatric healthcare providers. For more information and a video on Fall Prevention, click here. For free exercise programs for residents of San Diego County, visit SanDiegoFallPrevention.org. This blog is for informational purposes only. The content is not intended to be a substitute for professional medical advice, diagnosis, or treatment. Always seek the advice of your physician or other qualified health provider with any questions you may have regarding a medical condition. The details of any case mentioned in this post represent a typical patient that I might see and do not describe the circumstances of a specific individual.